Daily eating a custard apple gives many health benefits. It has nutrients such as anti-oxidants and potassium is beneficial for health. But in some conditions it can cause harm by eating more. Custard apple contains protein and calcium. This strengthens bones and muscles. Custard apple contains carbohydrates. This avoids weakness and gives plenty of energy. Custard apple has potassium. This avoids heart problem. Custard apple has zinc and copper. This increases glow of the skin. The hair become thick and long. Custard apple has phosphorus. This strengthens the tooth. It is beneficial to avoid gum problem. Custard apple has high amount of calorie and sugar. The more consumption of custard apple increase weight. Custard apple has fibers. This might create gastric problem and acidity. 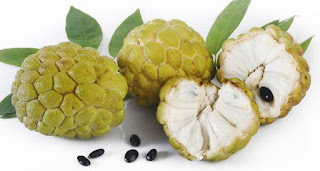 Custard apple increases blood sugar level. Therefore, diabetic patient should avoid custard apple. Custard apple has high amount of iron. The more consumption of custard apple might increase constipation problem.